Icosahedral T=21 capsid 56 nm in diameter, composed of 1200 P1 (spike) and 60 P2 (capsid) proteins. The pentameric receptor-binding spikes are protruding from the 12 fivefold axes. 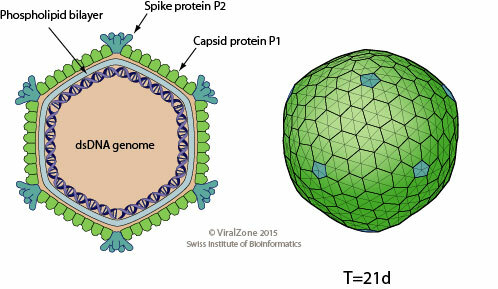 The capsid encloses an internal lipid core containing the structural proteins P3 to P9. Circular, supercoiled dsDNA genome of about 10 kb encoding for 21 proteins. Displays a very high number of negative supercoils. The genome is organized in three operons. Capsid proteins polymerize around a lipoprotein vesicle translocated in the cytoplasm by virion assembly factors. ETYMOLOGY Cortico: from latin, “crust, bark”.